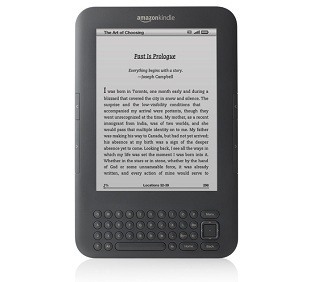 This entry was posted in E-Book Readers, Kindle Thoughts and tagged e-ink, Kindle updates, reliability, sales, thoughts, Upgrades by matthew. Bookmark the permalink. > There may come a time when stagnant growth for the line is not the sign of problems. I don’t think saturation is a problem at all, because they’re clearly looking to find the profit in the media they sell, not from the device. In fact, the longer a Kindle lasts, the longer that captive window into the Amazon store lasts. If the Kindle dies, there’s a small chance they reconsider and switch readers, and therefore stores. I’ve not sure if you’ve dealt with Kindle support, but they mail new Kindles to you at the drop of a hat. My brother in the Army broke his brand-new Kindle in Iraq, and I handled the return. I admitted straight out that the screen was likely broken during transport in his duffel. The guy didn’t blink an eye, no problem sir, I received the replacement before I even mailed the broken one back. How many companies do that? I’ve never experienced a return like that. Its like a drug dealer – You lost your crack pipe? Bummer man, here’s a new one on the house! Now whatcha need? I agree. Amazon is never going to have a problem with saturation. That’s their whole plan. I was trying to point at a flaw in metrics that generally seem to be designed around traditional hardware providers who need to make money off their hardware sales. The day Amazon stops being able to increase the pace at which they sell eReaders is probably going to be a good one for them rather than the other way around. Personally, I like my Apple products but Kindle is starting to give the iPad some genuine competition.